On an Autumnal afternoon, I can feel winter is approaching fast and I can only think of comfort food and all snuggled up. 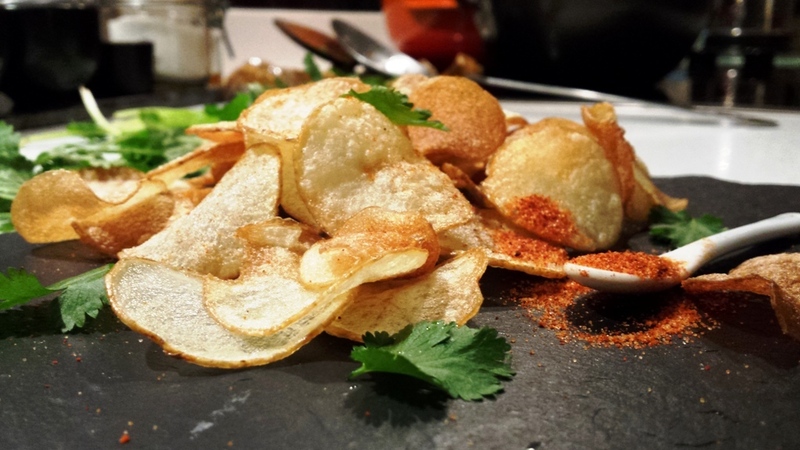 So I share these crunchy bowl of fresh homemade chips…. Peel and wash the potatoes. Using a mandoline, or vegetable slicer finely slice the potatoes into very thin slices. Put the sliced potatoes into a bowl of water. This will prevent the potatoes from going brown while also remove any excess starch. Place a deep heavy pan on the hob, add oil and turn heat on, leave to heat until quite hot. Meanwhile drain the potato and blot dry thoroughly in a kitchen towel or paper towel. When the oil is hot enough, carefully start by deep frying the potatoes in batches. Using a large spatula keep turning the potatoes because they will fry very quickly. As they turn brown and crisp on the edges (usually takes about 4-5 minutes), remove with a slotted spoon and place on a kitchen paper. Sprinkle with lots of freshly ground black pepper and paprika salt. 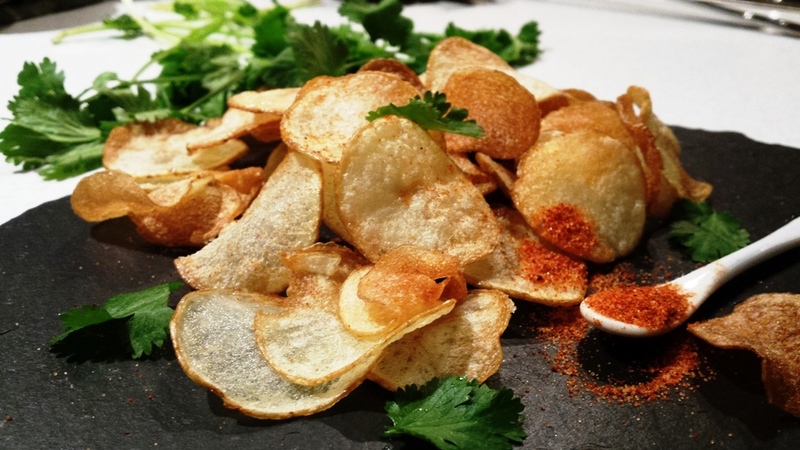 Serve hot and enjoy these delicious crispy homemade crisps. Here served with fresh coriander.